Are you planning an adventurous trip into the rainforests? I am sure you will agree that a pair of boots is one of the most important gears to arrange before you embark on your trip. Wondering if you can go along with your favorite leather boots or the Gore-Tex one you just invested in? Don’t make that mistake! 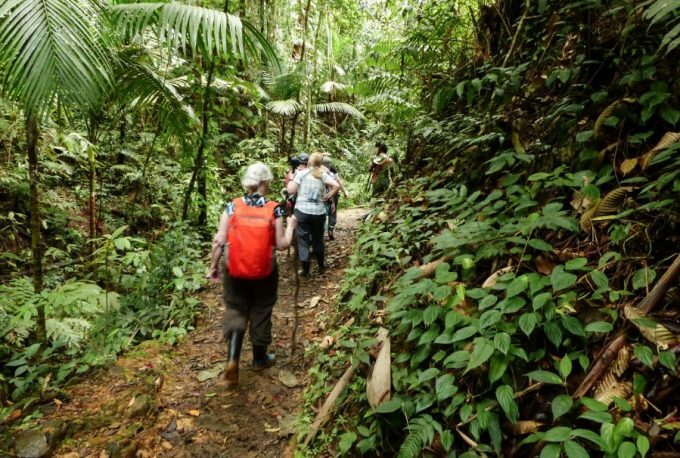 Take your time to look for one of the best jungle boots so that you can have a safe, secure, and comfortable trek in the tropical jungle. This article is an attempt to make things easier for you. I’ll talk about a few popular jungle boots and what customers have to say about each of them. But, before that, I’ll give you an idea about what features make jungle boots so useful. Why you require jungle boots? 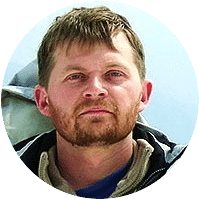 The main reason why your leather or Gore-Tex boots are not an ideal fit for trekking in the tropical jungles is that they are not as breathable as required. Even if Gore-Tex is a breathable and waterproof material, it does have its limitations. Gore-Tex boots may keep moisture out, but they may fail to keep your feet dry from excessive sweating in hot and humid conditions. The same goes for your standard leather boots. They are just not made to act as breathable as jungle boots designed specifically for such conditions. Long hours in the jungle wearing these boots may result in problems like trench feet, blisters, and athletes foot. Jungle boots, quite unlike other boots, have vents that allow water to enter, but also allow easy drainage of water and sweat, thus helping your boots and feet to dry quickly. This makes them suited to hot and humid conditions of the jungle where no other type of boot can keep your feet dry, however, breathable they may be. 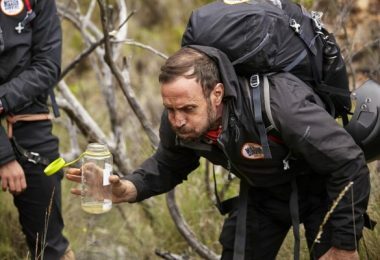 Let’s look at a few features that were specifically built into jungle boots to enable them to stand up to the harsh conditions a jungle throws in your way. Jungle boots are best made up of a material that is breathable rather than waterproof. The uppers of these boots are usually made of a combination of leather and nylon. Nylon, being a highly breathable fabric, results in making these boots breathable and lightweight. Leather provides durability to the boots. The soles of jungle boots are usually made of rubber. 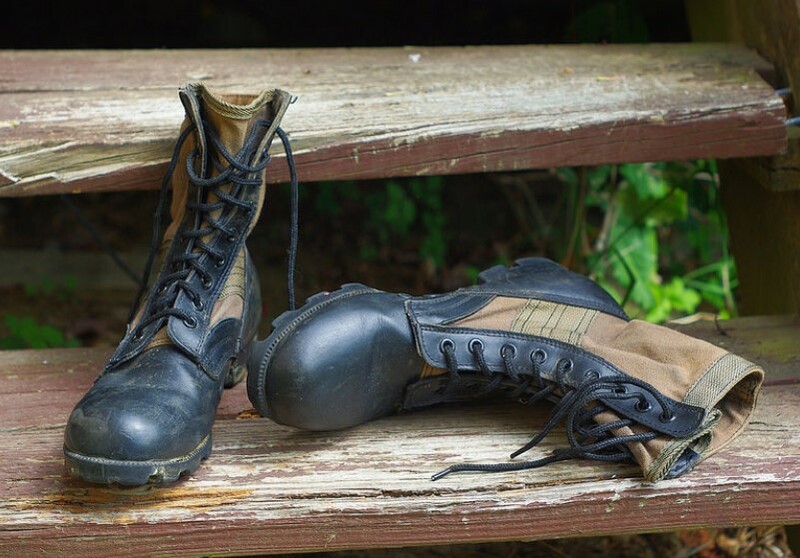 Originally, during the second world war, soldiers used boots that were meant for flat and dry surfaces. Panama soles were later developed to make boots better suited to muddy uneven surfaces of the jungle. Panama soles have inclined sharp lugs which help to shed mud off the soles and thus, provide a better grip on muddy, slippery, and uneven terrain like marshes and tree roots. Sometimes, the sole encloses a stainless steel shim for spike protection. Vents form an important feature of jungle boots. Vents are found on the instep of the boot. This help to drain away excess water and moisture from the boots, and at the same time, help maintain an airflow, which enables your feet to dry completely if they get wet in watery areas of the jungle. Steel shanks in the midsoles of these boots serve two purposes. Jungle boots come in different lengths ranging anywhere from 6” to 10”. Choose one with a long neck not only for extra support and stability but also for protection from ticks and bugs. A long-necked boot will cover a greater portion of your leg and will also prevent insects entering through your covered trousers. These boots usually feature high laces so that ants and leeches cannot enter them. The following are a few little things that may make all the difference in the use of your jungle boots. Comfort – It is important to see how your feet feel in a pair of boots. Make sure your jungle boots fit well. 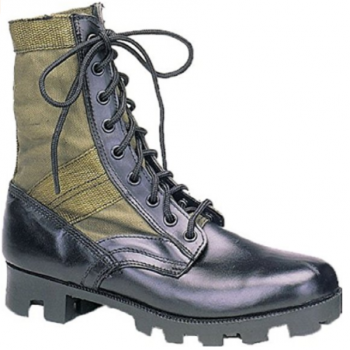 Materials like nylon make modern jungle boots quite lightweight and thus comfortable to wear for long periods. Also, make sure there is ample ankle support. Insoles/boot socks – These are necessary to minimize friction from your feet rubbing against the boot. Wear proper boot socks, not normal socks, to protect your feet from probable damage due to friction. Choose a durable pair – Go through reviews and do your research so that you can purchase a pair of boots that has proven to be durable. A durable pair of jungle boots will have a minimum chance to tear apart in the middle of nowhere. 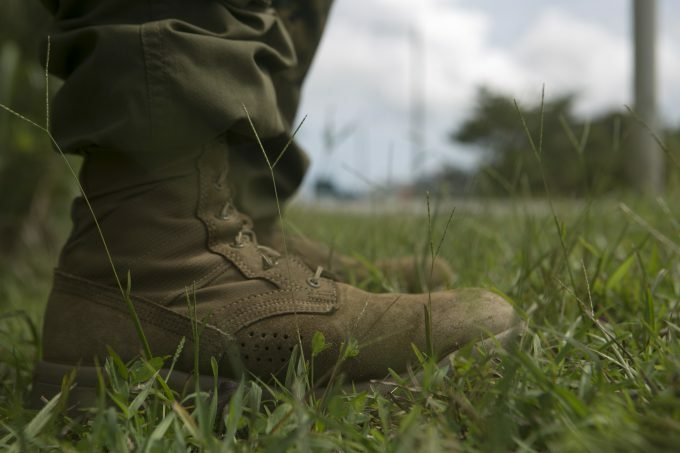 No doubt, there are military standard jungle boots costing hundreds of dollars. However, if you are hesitant to pay a large amount for these, there are great alternatives to consider. Read on to find out more about such jungle bootsand what customer experiences have to say about them. Stansport Jungle Boots are made of a combination of full-grain leather and nylon, which help to provide of breathability and comfort while being lightweight at the same time. Ventilation panels help to eliminate excess moisture from the boot. The boots are not lined at all to keep up the air flow and thus make them more breathable. They have steel shanks to provide sufficient ankle support. Rubber outer soles provide the required traction and support. A leather insole is provided. You could also use your favorite insole or socks instead. You may find these boots more comfortable with better insoles and ankle inserts. These boots come at a very affordable price and are a comfortable pair to have for mediocre outdoor activities in hot and humid conditions. They, however, are not very true to size and seem to be a bit bigger. So, do order with care. These are available in black and olive drab colors. 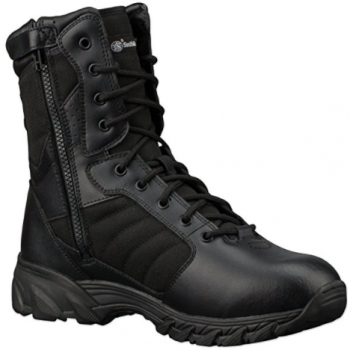 Best Use: A durable pair of boots for tactical purposes and professionals as well as for enthusiasts. The Smith & Wesson Breach 2.0 by the famous Smith & Wesson are of a strong and durable construction, and lightweight at the same time. Made of leather and nylon for safety and comfort, these boots, with their useful features, have proved to have satisfied most customers who have tried them on for long hours at work and otherwise and found them to be surprisingly light wearing and comfortable. They feature an EVA midsole and a strong steel shank that provide support. Being board-lasted, these boots are capable of allowing you to comfortably wear them for long periods without a hint of foot fatigue. Their rubber outsoles provide a good grip on tough terrains like ladders, waxed surfaces, and others. The YKKâ side-zippers are extremely easy to use. The reinforced toes give a spacious but snug fit, which make them all the more comfortable. The gusseted tongue padded with foam provides breathability and protection from dirt. The collar, made of PU, is easy to clean and maintain. What’s more! You get all of these features at quite an affordable price of around $70. Choose a desired length of either 6” or 9” as per your requirement. You may want to go for better insoles, though. Related: If you would rather look into a pair of waterproof boots for daily use, try Smith & Wesson Breach 2.0 Waterproof Boots which features HydroGuardâ construction. Or, consider Smith & Wesson Guardian Boots for a heavy duty pair of waterproof ones. Specific Features: leather and cordura type nylon uppers – unlined for breathability, rubber outsoles, lightweight, vented holes for ventilation. Best Use: Good if you are looking for a cheap option. 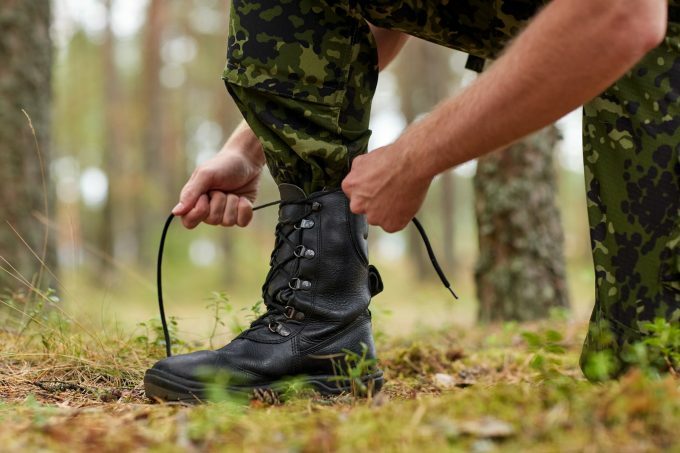 The black Shoe Artists Combat Boots are an affordable pair of jungle boots that are reported to be quite satisfactory at their job but for a few little drawbacks. They are made of a combination of genuine leather and nylon. The uppers are unlined to ensure that they are breathable – an important feature required in jungle boots. Rubber outsoles provide good traction and are meant to be durable. 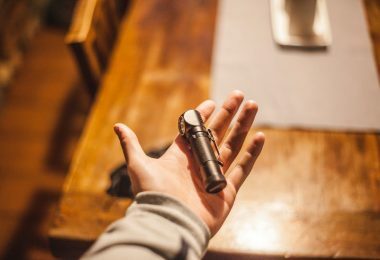 However, a few customers have found that these are not very durable and cannot be completely relied upon for a very long use. These are alright comfort wise, though they do not come with good insoles. So, add an insert of your choice for comfort. Vents allow moisture to escape and you’re your feet well ventilated. These are jungle boots, and thus are most suited to hot and humid climates and may not be a very good option to venture out in the snow. A few people have reported that they can leave marks on hard surfaces. So, remember to use with care indoors while you try them on. They seem to smell strongly of rubber and leather right out of the box. Air them for a couple of days to get rid of the smell. Unlike in the description, though, it does not come with a steel shank. Overall, a moderately comfortable jungle boot to own for a very low price. The lace grommets may need reattaching as there have been a few experiences of them coming off. Use them for occasional hiking trips in the tropics or for a comfortable daily use in industrial conditions. Related:For similar items in different colors and slightly different make, see Shoe Artists’ Leather Suede Combat Boots, Green G.I. Combat Boots, and Camouflage Jungle Boots. Specific Features: Nylon and canvas upper, leather heel and toe, vents, Panama sole, GI Government Issued style, padded collar, rubber sole. Best Use: Heavy duty activities on construction sites, camping, etc. The Panama Sole Military Boots are constructed to be suitable for heavy duty purposes like at a construction site and in industrial conditions. Made up of Cordura type nylon and canvas uppers, these are designed to be breathable and comfortable. The heel and toe are made of leather. Vents provide the required ventilation. All for a very reasonable price of just above $30. These do not come with insoles, and you may find it uncomfortable to wear them as such. Invest in some good gel insoles for a comfortable experience in these boots. These dry pretty well when they get wet. Perhaps, they would not last for years – some customers have seen the material form holes and get damaged in other ways after good use. But, at the price that these come for, they are comparable to expensive boots. One thing to consider before ordering these is their confusing sizing. They seem to come in at least 1 or 2 sizes bigger. So, be sure to order a smaller size than your shoe size. These are available in olive green and black colors. Related: For related jungle boots, take a look at the Panama Sole Speed-lace Military Jungle Boots. 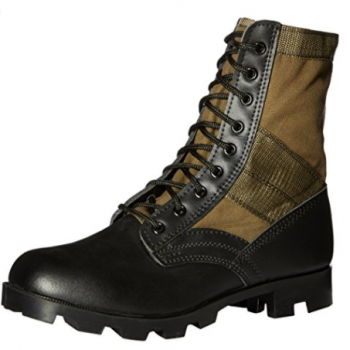 Best Use: A great alternative to high-end military boots – use them on a jungle trek or for heavy duty purposes. 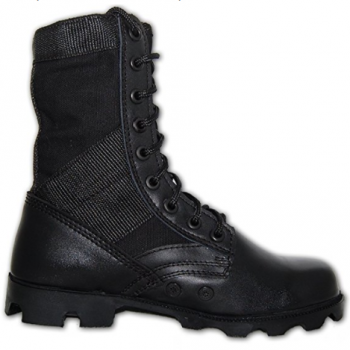 The Maelstrom Commando Boots has been designed with tough materials conforming to military specifications. The uppers are made of full grain leather that is polishable and cordura type nylon. These materials give them good looks as well as breathability and flexibility. The vulcanized rubber Panama sole makes a strong union with the uppers. The sole is slip-resistant on tough ground. The sole contains a steel shim that gives a spike protection. A steel shank provides support. Padded collars on the boots add to the comfort they provide. These boots come with removable insoles. Lace grommets are made of non-rust metal. These boots also have a couple of metallic vents that provide ventilation and drain excessive water and moisture. If you have been wanting to own military boots like the ALTAMA but are put off by their price, you have to consider these. 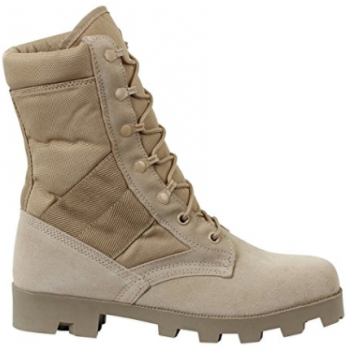 These are military boots that are durable and comfortable at a much more affordable price. Choose the black one or go for tan ones. Order a size smaller as these are bigger than your shoe size. Air them to get rid of their smell and break them in for a comfortable fit. Related: For a related pair of tactical boots for outdoor activities in muddy and such conditions, consider Maelstrom 8” Tac Force which comes with useful side zippers. Best Use: GI style boots for day-to-day use and small jungle trips. The Rothco Speedlace Boots in Desert tan color are designed in the GI style. The leather and nylon uppers are quite light and breathable. The boots slip on and off quite comfortably. The outer sole is a rubber Panama style one. These boots come with padded collars for extra comfort and removable cushion inserts. Speed-laces make it easier to put on the boots. You can loosen the laces with a little pull at the sides of the boots. With all these features, however, these boots have failed to satisfy most customers by not ranking high on the durability index. Many customers have reported experiences with these falling apart after minimal use. On the other hand, many people have also had good experiences with these. Many have found them lightweight, comfortable, flexible, and durable when used in the desert and such conditions. Perhaps these wouldn’t be the go-to boots for very heavy duty purposes, but would be good at their price for daily moderate use like in paintball and in hot conditions like in the desert. If you are looking for a good pair of jungle boots at a reasonable price, you can definitely give these a try. They may be just perfect for you! 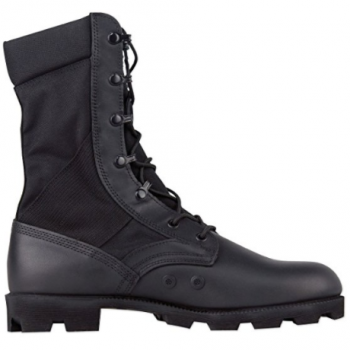 The Rothco GI Type Boots are lightweight boots made of canvas and nylon uppers. They are unlined and meant to be used with separately purchased thick boot socks or insoles, without which, you could develop blisters and hot spots. With proper boot socks, though, these boots are comfortable enough to last for quite some time. As they are lightweight, you can use them comfortably for long periods. They have good ventilation, which is a must in jungle boots. Deep lugs on the soft rubber Panama sole allow them to be provide a good grip on wet surfaces and a great traction even on loose surfaces like sand and dirt. A few customers, however, seem to not like their look and find them to lack shine. The material seems to be of a mediocre quality and thus, you may expect these to not last very long. At their price, however, they are functional enough. Have You Chosen a Pair of boots for your Next Jungle Adventure? As discussed in detail, jungle boots are specifically designed to keep your feet dry and safe in hot and humid tropical environments. 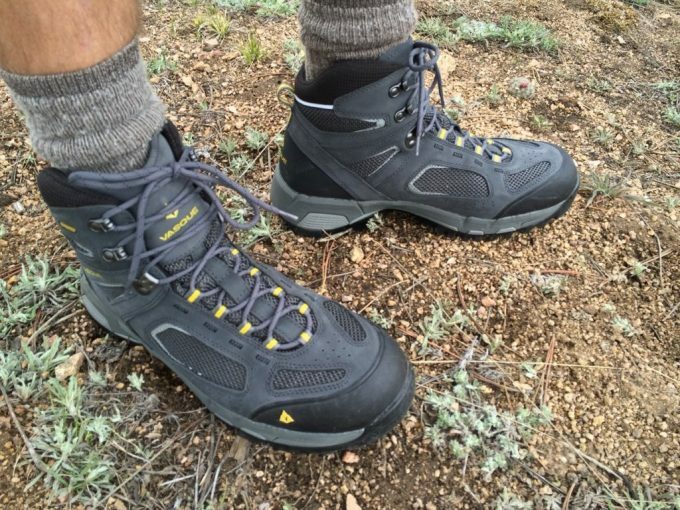 And, as promised, I have reviewed a few popular jungle boots. If you are looking for jungle boots for professional, tactical, or heavy duty trips and outdoor activities, choose between Smith & Wesson Breach 2.0, Panama Sole Military jungle boots 5081, or the Maelstrom Commando boots. 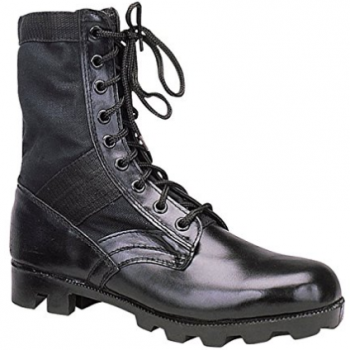 The Maelstrom Commando are also a great alternative to Military Combat Boots like the Altama. If, on the other hand, you are looking for jungle boots for light use, choose between Stansport jungle boots and the Rothco ones. Do you have any personal favorites? Would you rather invest in a high-end Military Jungle Boot pair? 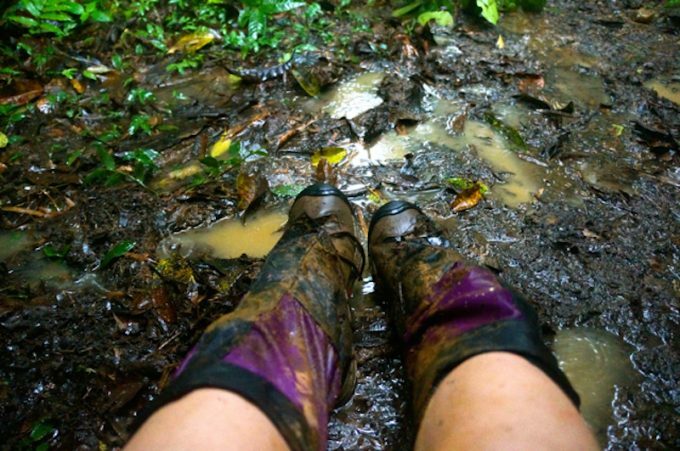 We would love to know about your experiences with jungle boots in the jungle and harsh tropical environments. Please feel free to drop a line in the comments.